This gives me great pleasure to tell you our reaction to your SuperPrimer. SuperPrimer is AWESOME!!! It eliminates a lot of guess work on priming issues. It coagulates a lot better than the powder products we have used before and it takes less concrete to prime using SuperPrimer, which makes our customers very happy. It is easy to store and since they are packaged in the bottles, there’s no worry if they get wet. It will not ruin the primer! It mixes with flowable fill easily to allow it to push through the pipe lines. We have shared some of our bottles with other pumping companies and everyone is simply amazed at the job it does and the operators absolutely love it!! We will never use powdered products again. Once again, thank you for a fantastic product that does exactly what we need it to do—and so much more!! We have been using Super Primer for over a year now and are very satisfied with its’ performance. This product is easy to use, mix and to store thus saving time. Super Primer is more efficient and cost effective than other products we have tried and it works well in both hot and cold weather. I am happy to recommend Super Primer. 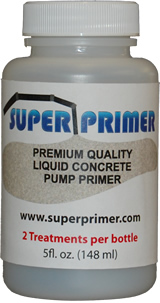 The Super Primer product that we use is very economical and convenient. Our pump Operators enjoy how compact it is, in order to carry and store on their pumps, and how easy it is to use. Also, considering these operators may have to prime their pumps several times a day that saves time and money.